Here in Southern Ontario, spring is in the process of being sprung. 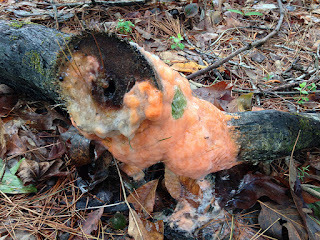 This means warmer temperatures and lots of rain, which can bring about the appearance of various sorts of goo. That's right, goo. Time for some photos! As cold winter transitions to cool spring, trees awaken and begin moving sap through their bodies. If a tree is an amputee or is otherwise damaged, sap can leak from the wound and provide food for a community of wind-delivered microbes. These include several species of brightly coloured yeasts such as the very pink Xanthophyllomyces dendrorhous, which I've written about before. 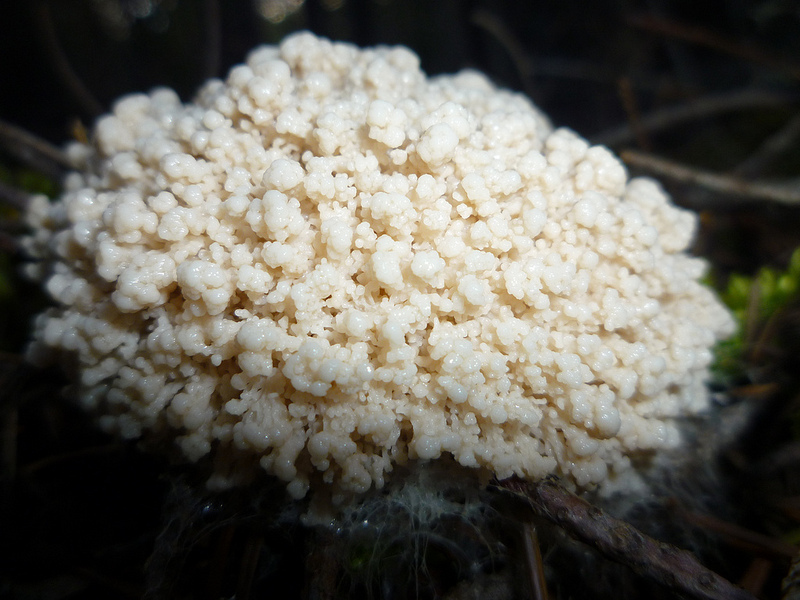 In addition to looking weird, the gooey stump microbes provide food for flies and tiny worms. Spring rains mean lots of wet wood, the preferred domain of many slime moulds. These organisms were once thought to be fungi, but we now know they're something else entirely. It's sort of like how we used to think fungi were plants and filamentous bacteria (Actinobacteria) were fungi. We've tended to give slime moulds affectionate names such as dog vomit (Fuligo septica) and tapioca slime (Brefeldlia maxima) due to the gooey consistency of the structures they develop at the end of their life cycle. These fruiting bodies are akin to mushrooms, as they serve to disperse spores to new locations. A classic marker of springtime is the appearance of masses of frog eggs (frogspawn) in thawed out ponds. These masses owe their gooey nature to several layers of jelly surrounding each egg. The jelly, which is made up of proteins and polysaccharides (long chains of sugar molecules), is necessary for fertilization to take place and also protects the eggs as they develop. 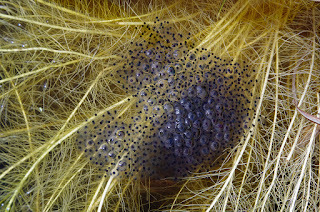 Incidentally, there's a type of green algae found growing amidst the egg masses of frogs such as Lithobates sylvatica (wood frog). 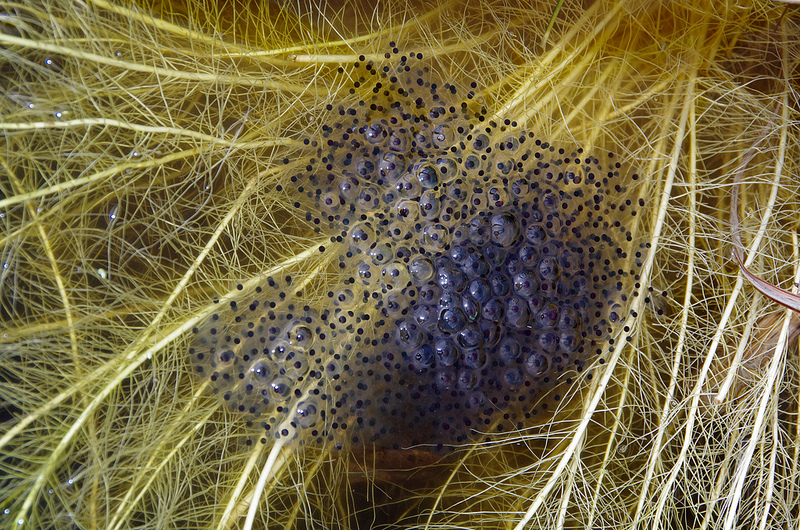 The algae and frog embryos appear to enjoy a mutually beneficial relationship. For example, they trade oxygen (algae -> embryos) and carbon dioxide (embryos -> algae), and likely sugars (algae -> embryos) and ammonia (embryos -> algae) as well. This last one's cheating a bit, but I managed to take a decent photo of it last weekend so here we are. 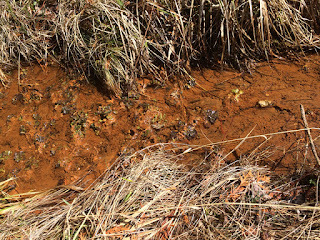 In low-lying places, water sometimes seeps to the surface and flows via a small stream partially filled with rusty slime into a nearby larger water body. The orange stuff is iron minerals (mostly iron oxides and hydroxides) and bacteria capable of using iron to generate energy (thus the goo). Deep underground, water can become depleted of oxygen and filled with a soluble (ferrous) form of iron. Once this iron comes into contact with our oxygen-rich atmosphere and iron-oxidizing bacteria, it's stripped of electrons and converted to insoluble (ferric) iron oxides, which come out of the water as an orange precipitate. Although orange streamlets can flow throughout the year, they're easiest to spot in the spring since there's no snow cover and the surrounding vegetation hasn't grown up around them.